Welcome to the new Learning Forward Illinois website. Our organization has a long history of providing support and guidance for the educators of Illinois. Goal #4: Increase the Learning Forward Illinois membership to include all areas of the state and to represent at least 20% of Illinois educators. Goal #5: Engage and collaborate with Illinois professional education organizations to guide and support the effective use of professional learning standards and practices across learning opportunities. Of course, we can only accomplish these goals in tandem with the educators from across Illinois. I encourage you to investigate this site to learn more about our organization. Check out our activities, see who is on the Board of Directors, and read through our Constitution. Most importantly, think about your role. 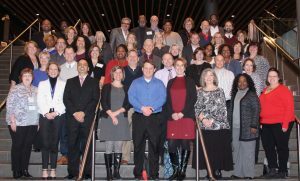 Perhaps you want to become a member…perhaps you want to participate in planning…perhaps you want to have an active role in leadership of Learning Forward Illinois. Any or all of these “wants” are possible. Please contact Kevin Seymour <<kevin.seymour@learningforwardillinois.org>> to see how you can become more involved.